The fifteen year six month career of D5127/24127 was spent allocated only to Scottish Region depots. Shortened fuel & water tank. Modified Headcode boxes - with sloped sides (No.2 cab only - fitted at Derby July 1971?). Time between withdrawal & scrapping: 14 months. December 18th 1975 to store (unserviceable). After withdrawal 24127 was stored at Carstairs until moved to Doncaster depot during May 1976, remaining there until about December 1976 when it was moved to Doncaster Works and broken up by April 1977. Noted Glasgow Works May 1973. Noted Glasgow Works October 1974. On March 23rd an eighteen coach ‘Grand Tour’ excursion ran from Edinburgh to Perth via Carlisle starting out with D368 & D1973. At Perth Class 5 44997 & A4 60009 replaced the diesels for the run to Aberdeen. Here Type 2s D5070 & D5127 ran out over the GNS mainline to Keith, Craigellachie and the Speyside line to Aviemore. A stop was made here to add D5122 for the run south over the Highland mainline, the two steamers rejoining the train at Perth for the final leg to Edinburgh. Condition August: green livery, blanking plate fitted (four slats). On September 5th the Scottish Grand Tour No 11 featured a circular tour from Edinburgh to Aberdeen and Inverness, with nine coaches in charge of 364. A restaurant car problem delayed departure from Inverness for two hours, but an intended stop of similar duration at Aviemore was curtailed to recover the ‘lost’ time. Time however was of the essence due to the long block sections and other late running services causing pathing problems. In departing from Aviemore oil pressure was lost and the Class 40 declared a total failure. The southbound ‘Royal Highlander’ was able to pick up some passengers off the special but it was not until the 19.37 relief Inverness - Euston appeared with 261 piloting 5119 & 5127 that a glimmer of hope appeared. Unfortunately the block section south of Aviemore was thirty four miles long (four boxes were switched out), so departure was still delayed. Finally three hours late at 21.22 the excursion headed for home, with arrival in Edinburgh at 01.43, 220 minutes late. On October 7th the Wirral Railway Circle 'Orcadian' railtour utilised 5127 & 5129 between Inverness & Wick. Condition June 1973: modified headcode box at No.2 end, has sloping wings similar to 24147 (believed altered at Dery Works during its July 1971 visit). Photograph collection of webmaster. 5127 is photographed at Dingwall on October 3rd 1973 with the 11.08 Kyle of Lochalsh - Inverness service. This locomotive carries the boiler grille blanking plate with four louvres rather than the more common five louvres. From time to time pairs of Type 2s were still utilised on the heavier, longer distance Scottish workings, on May 3rd the 15.35 Glasgow Queen Street – Aberdeen was powered by 25026 & 24127. On November 12th 24127 was noted at Glasgow Queen Street in charge of the 08.35 service to Oban, Class 27s being the more normal power on this line. 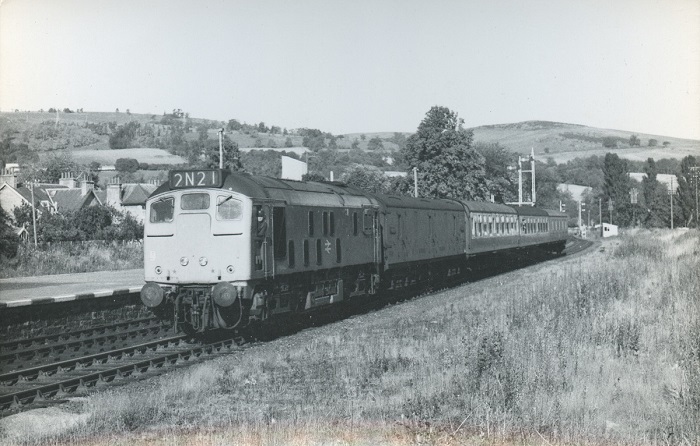 24127 was withdrawn February 2nd 1976, as was sister locomotive 24126. Condition final: blue/yellow livery, gangway doors removed, headlight location sheeted over with square plates at No.1 end, headlights fitted at No.2 end; shortened fuel & water tanks, fuel tank has circular gauge, solid blanking plates fitted (four slats), hand/footholds plated over, cantrail water filler present, three-rung bogie mounted footsteps, ridge sided sandboxes. three piece miniature snowploughs fitted, vertically hinged battery isolating switch cover, modified headcode box at No.2 end, has sloping wings similar to 24147. Page added July 30th 2016.